It's nothing less than a triumph, really, that a company like GM could overcome their considerable shortcomings and come out with a reasonably priced world-beating sports sedan like the Pontiac G8 GXP. Whatever their recent successes, the company has history of taking careful aim at a performance target and hitting themselves squarely in the foot, so some skepticism is only natural. Yet there's no denying the monumentally good news: for a few weeks at least, Pontiac could deliver a daily-drivable four-door Corvette for not that much more than a fully-optioned minivan. But bad news is everywhere these days. Due to recent global events, Pontiac is dead, and the G8 GXP with it. And that, speaking strictly from my recent personal experience of driving the G8 GXP, is just not fair. I was trying to be upbeat about my time with the LS3-equipped GXP. After all, it's the most powerful Pontiac ever and the first to be fine-tuned on the Nürburgring. Unfortunately, instead of wringing the car out in the Hudson River Valley, I had to spend quite a lot of that time at a wedding in moderately distant Baltimore, meaning I would be droning along on the New Jersey Turnpike. Well, fair enough. Brian and Karen are very dear friends for whom I would sacrifice a lot, and were well worth the minor sacrifice of driving Pontiac's four-door Corvette the way most of its buyers probably would have, had it but lived. And in these times, we take our celebrations where we can get them. But seriously, I thought as I sized up the Lincoln Tunnel from GXP's driver's seat, it is-was? It's difficult to discuss the recently departed — the most powerful Pontiac ever. Nothing with a flaming chicken or a superfluous tachometer on its hood ever had the 415 horsepower and 415 pound-feet of torque this car gets out of its aluminum 6.2-liter small-block. It's almost certainly the best handling, as well, and with the very good Tremec 6-speed my car was blessed with, potentially quite a lot of fun. Certainly worth mulling over, because right away, you can't tell. The loud pedal isn't, really; there's a potentially magnificent eight-cylinder rumble in there, but it's less of a bang than a whisper and you have to be listening for it, especially around town. 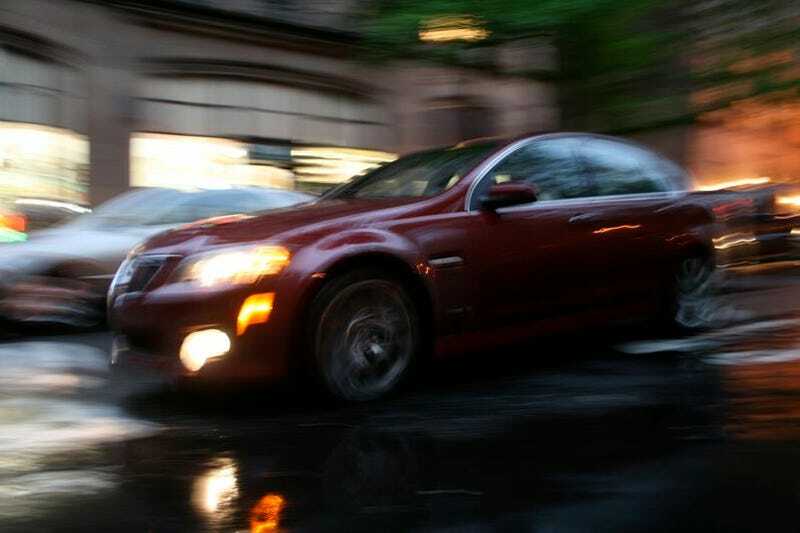 The styling is also quiet, if unspectacular; the GXP has a somewhat more aggressive nose, a small spoiler, 19-inch wheels and some understated badging to set it apart from the mere G8 GTs out there, and although both cars have the suggestive hood vents, neither one exactly screams world-shattering performance. And driving it in Manhattan traffic provided no immediate clues, because the ride is direct but supple, the steering is a bit light, the big Brembos only the slightest tad grabby, and the clutch perfectly manageable. All of this is actually very good manners for a sports sedan, and it speaks to a high degree of well-engineered tractability and civilized behavior in what is a very powerful car. If it was this good in its youth, I would have really enjoyed seeing what it was like when it grew up. Unfortunately, inevitably, there are still growing pains in this stillborn enfant terrible, as I noticed when I became bored with stop-and-go traffic and began puttering around the cabin. Now, General Motors earns a lot of flak for its cheap interiors, so it should be pointed out that this one at least looks pretty okay. There are four very readable dials in front of you framing a red-on-black information panel. The steering wheel is thick and nicely padded, the shifter is in exactly the right place, decent leather seats are standard, and probably most importantly for soothing my traffic-fueled temper, the Blaupunkt stereo is a truly excellent conduit for your music player. But for the love of all that's holy, don't let anything but the steering wheel or the shifter come into contact with your skin. This cabin was designed by someone who had learned a basic sense of ergonomics and design, but the materials were evidently spec'd by someone born with no sense of touch. The dash doesn't feel so much like plastic as some sort of depressing plastic-maché. The shifter boot is made of some oily synthetic so horrendous that I had fun daring passengers to touch it. The sliding sunroof cover is obviously a piece of brittle old linoleum Kryloned flat black. Worst of all may be parking-brake lever, which wouldn't pass the quality check for a three-dollar umbrella handle. At times it was like riding in a car made of cheap bathroom tile and fungus. But most times it simply does not matter, because it was, and perhaps always will be, the most powerful Pontiac ever. Not just that-this car, had it but lived, would have been one of the great bargains of our time. The 6.2 liter LS3 engine under the hood is not just good but magnificent, a tame avalanche, a volcano in harness, the final argument of kings. And yes, we must get our superlatives in while we can. We may not have much time. Well, then. Simply put, anything that allows you to actually enjoy the New Jersey Turnpike, even for only a few scant minutes, is a triumph of human achievement. Rationally, the G8 GXP may be considered as only a perfectly adequate car wrapped around a Z51drivetrain. But after driving it, it's hard to consider it rationally at all, because this car is Hell's own hammer in a brown paper bag. You can pass a semi before your passengers can read the writing on the trailer. You can make them motion-sick just by going in a straight line. You can cross New Jersey so quickly, as it turns out, that you don't have time to complain about being in New Jersey. Relativity may come into play. It had certainly came into play by the time we arrived in Baltimore, where I must admit I made my passengers ill by rodding about the city streets in a not altogether sedate fashion. It wasn't a twisty back road, but since Baltimore is one of those Eastern cities apparently laid out by generations of morons, it was just curvy enough to demonstrate how good the GXP's chassis is. Nürburgring or no, this car is so neutral, predictable, and downright pleasant-handling that in less dire circumstances it would give me great hope for the American auto industry. And what do you know? It still does. It may have been an Australian platform with a Mexican drivetrain, a German stereo, and a lowly 4% domestic-parts content, but a solid V8 sedan is as American as it is anything. And an American company at least thought to build one. That was a good start. So maybe the GXP, as a product, is dead and gone before it could do any good, and that may turn out to be as tragic and shortsighted as taking Old Yeller out behind the barn and shooting him when he was still a puppy-Who knows? It might just have grown up to save GM from the bear market. But more importantly, the idea of the GXP, as a set of blueprints, as a testament to what the company could do when it wanted and may with a little luck do again, can't die. It was, and is, a damn fine automobile that provided a little bit of hope and a hell of a lot of fun. Long live the GXP.